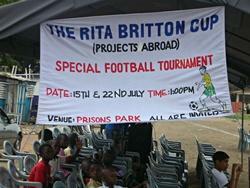 The annual George and Rita Briton Cup tournament, organized each year by Projects Abroad, took place on December 4 and 5, 2009 at the Prisons Park in Accra. Tom Davies, Country Director of Projects Abroad Ghana explained that the event forms part of his outfit's social responsibility to develop local talent. In an interview with Daily Guide Sports, Tom said that Projects Abroad, “...intends to establish a soccer academy in the next few years to nurture some young talents. It is in this regard that we launched this annual George and Rita Briton Cup tournament. It is basically to unearth talents and send them abroad for justifiers,” adding that after last year's event, three young soccer players had the opportunity to travel abroad for trials. “This year we have local U-14 and 17 colts teams like Shepherd Stars FC and AC Milan taking part. After the tournament, we would select the best talents, groom them and send them abroad for justifiers. Apart from the volunteer services we render in the fields of journalism, medicine and human rights among others, we feel that since soccer is the passion of the nation, our contribution to national development would not be complete without it,” Mr. Davies noted. The photograph shows last year’s welcome banner to the Rita Briton Cup.